Nature has been very forgiving in this respect, a mother's milk is designed to offer complete balance diet to her child. It helps your young one at the time of hardship and famine. A poor and incomplete diet will have adverse affect on your health more than your breastfed kid. It is very important for you to maintain regular meals in order to gain essential nutrients but the amount you eat or drink doesn't actually determine how much milk would be produced. You as a mother are blessed by God with this beautiful gift of breastfeeding. Your body produces high quality of milk for your little champ despite any adversity, which states that you eat awful and still can make awesome milk for your child. It is important for you to understand that not everything you consume converts into your breastmilk. Milk is formed from the nutrients and vitamins that flow in your blood stream and not what goes into your stomach. There are some foods that get added to your breastmilk and sometimes they do affect your little munchkin as well. Foods like broccoli, garlic, beans and other gassy foods. It has also been found that spicy and other acidic foods like tomatoes and citrus fruits are major reasons for your kid to get fussy. Generally, it is observed that what mother eats has no effect on her child. So, it is recommended that you eat whatever you want to, in whatever quantity you want to and whenever you want to and you can continue to do so, until you notice an obvious reaction in your baby. Your baby is too young to express his opinion about the food you eat but still somehow he manages to give you some warning signals with respect to the food. Signals are in the form of stomach ache, rashes, irregular motions, itching, bloody stools, etc. As a mother, it is very important for you to find out the food that is causing problem to your baby. The best way is to maintain food diary. It will help you to keep a track of what you eat and record your child's reaction. Another way is that if you suspect that some food item is troubling your baby then eliminate it for a while. It takes approximately 14 days after elimination for any food to influence breastmilk, reintroduce it and observe if it has same adverse effect like before. 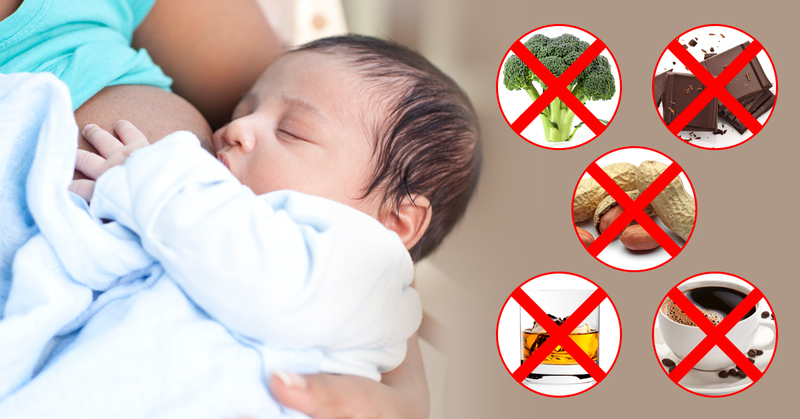 Through breastmilk, alcohol does pass from you to your child and it directly impacts your kid's neurological system. But, it has been studied that 2% of your total consumption gets mixed with your milk. So, one can consume twice per week. It contains a substance known as caffeine, which also passes from you to your baby. Like alcohol, the percentage of mixing with breastmilk is low. Therefore, you can consume 1-2 normal sized cups in a day. But, if your baby acts weird and seems sleepless then you might need to cut back. Generally, it is not the lactose that mixes up with the breastmilk. It's the dairy protein that passes through breastfeeding which is the main cause of problem in your baby. If your young one shows the signs of allergy sensitivity, then cow milk is to be blamed. You have to eliminate it for a week, again give a try of consuming it, if same symptoms prevails then you might have to eliminate it completely. But, the good news is that most of the babies do outgrow this sensitivity in few months. Chocolate is rich in substance known as theobromine. It has similar effect on your baby as of caffeine. If your baby exhibits cranky behaviour, it seems sleepless than you have to keep chocolate out of your own reach and cut down its consumption completely. Citrus fruits are acidic in nature and may hurt your baby's tummy or he might develop rashes from his diaper. It includes fruits like lemon, orange, grapefruits. If you plan to cut them down from your diet chart so you can introduce other fruits that can alternate these, like strawberries, papaya, etc. These two herbs, if consumed in large quantity, it reduces breastmilk. When you consume garlic, the smell of garlic passes to your breast milk. It depends on your baby whether he accepts the smell or not. If you have family history associated with it, then you have to be very careful while consuming it. It might have adverse effect on your baby like stomach ache, rashes, etc. Before arriving at your own opinion about what to eat and what not to eat, you need to consult your doctor he might help you with relative alternates so that you need not have to sacrifice with your health. You have to keep a continuous check on your baby’s reactions and behaviour. It calls for an alarming situation if you seek symptoms like diarrhoea, wheezing immediately after breastfeeding your baby you need to consult your doctor.